1, 5, 7 have two similar elements, one inside the other. 2, 4, 8 have one element placed inside a different element. 3, 6, 9 have two similar elements, one inside the other and the area between the two elements is shaded. 1, 3 contain a V-shaped element inside a geometrical figure. 2, 4, 5 contain two similar elements, one placed inside the other and touching it. 6, 7 contain geometrical figures which are divided into four equal parts by two mutually perpendicular straight lines. 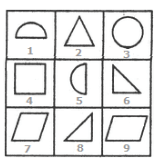 1, 2, 5 are figures that have patterns formed from four lines curved in a concave direction. 3, 7, 8 are figures that have patterns formed from four lines curved in a convex direction. 4, 6, 9 are figures that have patterns formed from these straight lines. 1, 5, 7 contain a rectangle with its two diagonals as the outer element and another element (similar or different) placed inside it. 3, 4, 8 contain a circle with its two mutually perpendicular diameters as the outer element and another element (similar or different) placed inside it. 1, 3, 5 are figures having partially or completely curved boundaries. 2, 6, 8 are all triangles. 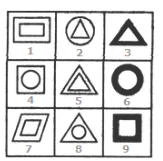 4, 7, 9 are all quadrilaterals.